An open letter to Apple, Inc. I am experiencing a problem with iOS 7. Specifically, the thin lines (text and objects), parallax motion, and aggressively swooping animations are causing me nausea, similar to feeling "car sick." I have turned on "REDUCE MOTION" to cut down on the parallax effect, which helps. I have reduced the brightness. I have turned on "bold" for my font preference in accessibility to help with the overly thin "vibrating" fonts on the screen, again, this provided some relief, but the interface is still full of objects that are composed of lines that are simply too thin, and there is way too much unnecessary motion. Despite all the changes, I am still experiencing nausea when using my phone with iOS 7 due to the aggressive swooping animations throughout the system. My phone is a 4S, which I have had for two years, and this issue stared with the upgrade to iOS 7, it never occurred before that. I also had a 3GS for two years before that, no problem with nausea there either. I went to research the issue, and have been finding similar reports that many many other people are having issues with this on twitter and in the blogs. I am writing to ask that that you consider prioritizing an update that allows us to scale back or turn off the unnecessary animations, similar to the preference that allows me to turn off the "genie" effect in the dock of an OS X Macintosh. Darien Gap's Chris Martinez - two original songs recorded acoustic and live. These are two original songs by Chris Martinez of Darien Gap. These are live acoustic solo recordings done at my home in July of 2013 with my Tascam DR100mkII and a Shure 57/58 mic combo, using a Behringer mixer and mic preamps. 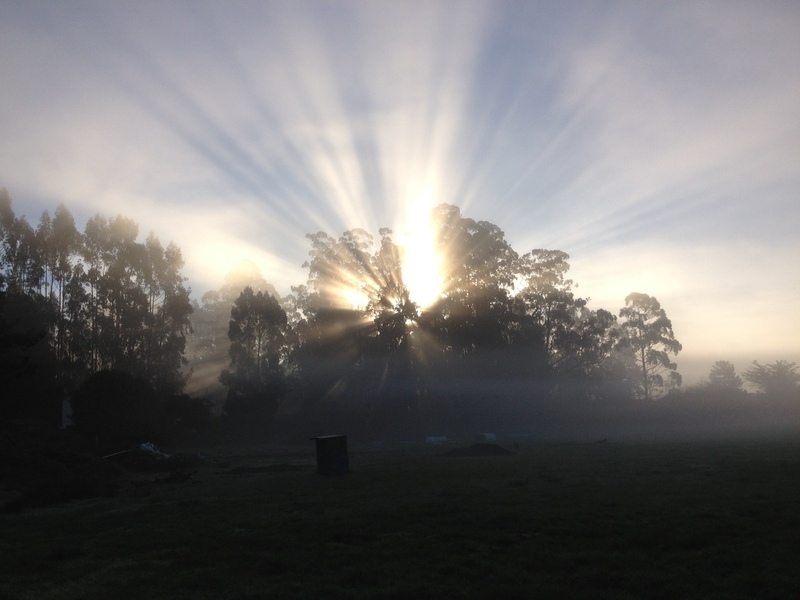 They have been compressed into 192k mp3 files and uploaded to Posthaven. My son is turning 7 years old soon, and he has decided to ask all his friends to help him do something different for his birthday. He is starting a donation drive for the local Animal Shelter. I am very proud of his idea and wanted to share it with you. Logan's bedroom is full up on toys and games, so we asked him what he'd want to do instead. Earlier this year, our next door neighbor adopted this handsome dog Django Reinhardt from the shelter. Also, Logan and Susan recently visited the shelter to donate old towels and meet the animals. 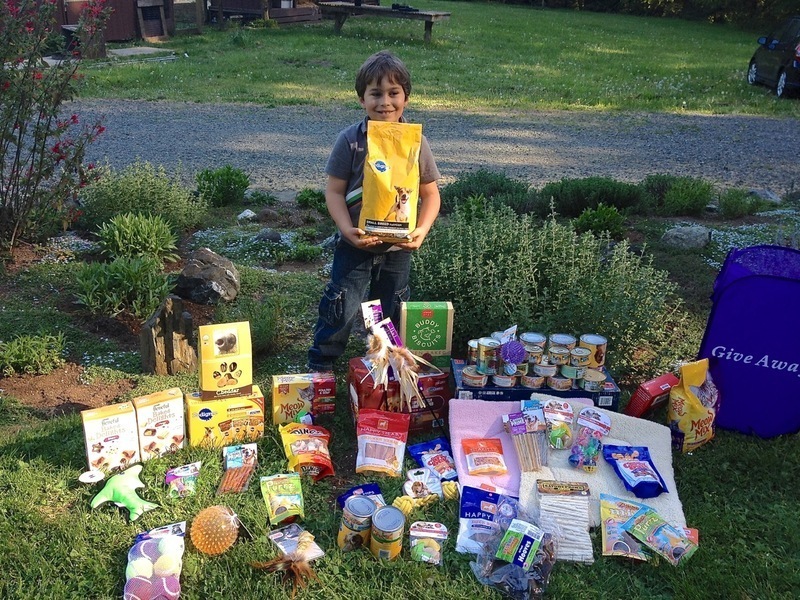 So, instead of giving him a present for his birthday, he's asking for his friends to help in putting together a big care package for the dogs and cats at the Humboldt County Animal Shelter. The donation drive for the local Animal Shelter was a great success! Here is a photo of Logan with all the great items that were donated at his party. In addition to what you see in the picture, there is a whole bin of towels, and $50 in cash! 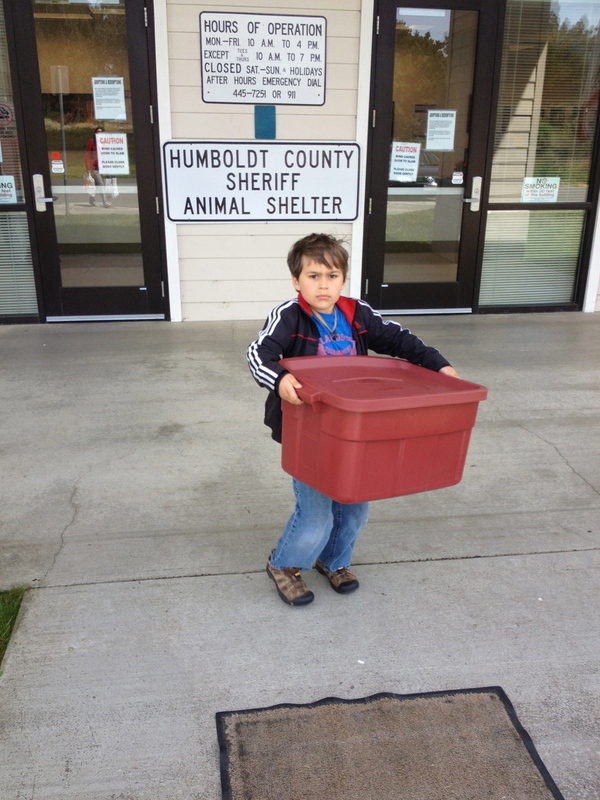 Here is Logan helping to deliver the donations to the shelter, and getting a VIP tour of the animals! Demand Justice for Arron Swartz - Tell Congress: Don't Expand the Computer Fraud and Abuse Act: Fix It! It's the vagueness and over breadth of this law that allows prosecutors to go after people like Aaron Swartz, who tragically committed suicide earlier this year. The government threatened to jail him for decades for downloading academic articles from the website JSTOR. Join the DEMAND FOR JUSTICE. Put a banner on your website. Call or write your representative today! One-sided censorship or inefficient automatic filtering? I took my car to Mid City Motor World (between Arcata and Eureka) this morning to have the oil changed and some other minor maintenance completed. I have been buying Honda's from Mid City, and having my cars serviced at Mid City, for many many years and I highly recommend their sales and service. I feel that they are a very customer-oriented business. They also offer a lot of nice amenities for customers waiting in the lobby. There is real coffee, ground from fresh beans, real cream for the coffee, fresh bagels with cream cheese (they need a toaster), tables next to wall outlets for you to set up your laptop, and free guest WIFI. The service writers all recognize me and they are all very professional. They even offer to wash your car for you before they give it back! Block reason: Forbidden Category "Political/Advocacy Groups"
I did what the message said, and asked the receptionist if I could talk to the System Administrator for Mid City. A nice gentleman named "Scott" came out and explained that their system uses a blocking system from Sonicwall, their router provider, and that he just checks "categories" of blocking, the specifics of deciding what individual site(s) to block is coming from information provided by Sonicwall (Sonicwall was recently bought by Dell Computer). Scott thinks that the Herald may have generated more visibility on the internet and has become listed as a political site within the Sonicwall database, where the Mirror has not generated that much coverage or interest and therefore is probably simply "not rated" which will not trigger any blocks. I asked Scott to check it out for himself and perhaps even consider not using the "political/advocacy groups" category for blocking guest access, since the Sonicwall blocking list is not filtering this category in a fair and impartial way. I will report back next time I am at Mid City and let you know if the situation is still the same. I received an update from the sys admin at Mid City, indicating that they had readjusted the firewall blocks to allow both the Mirror and the Herald through their firewall, and has submitted both to Sonicwall for re-rating. I have not been back to test it, but I wanted to give them credit for great customer service and followthrough. Thanks Mid City! "Thank you for bringing to my attention the problem with the two web sites that you were trying to reach while having your vehicle serviced at Mid-City Motor World. I have attached the SonicWall rating for each of the sites that you tried to reach while visiting our store. 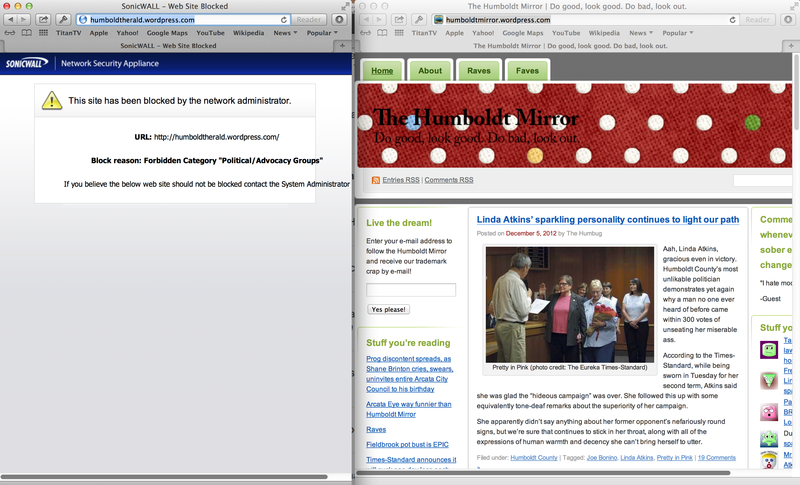 We have adjusted the settings of the SonicWall, to allow the humboldtherald.wordpress.com. Again thank you for bringing it to my attention and sorry for any problems that it may have caused." We had a bit of a rough night. 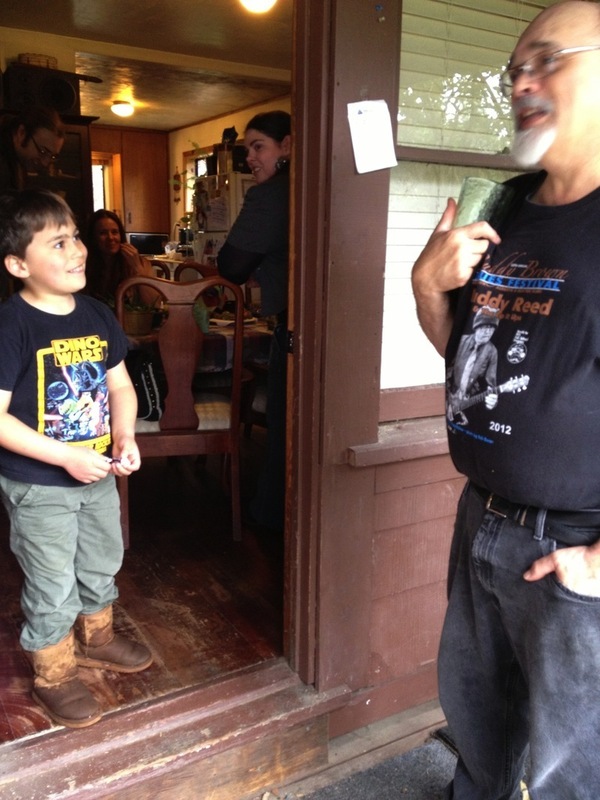 The boy was not feeling well and we were not sure if he was going to be up to the traditional Easter Egg Hunt, family gathering, and celebration of the birthday of Cesar Chavez or not. But he bounced back this morning, and we were back on track for our countdown to the Great Santa Easter Egg Hunt! I should explain. 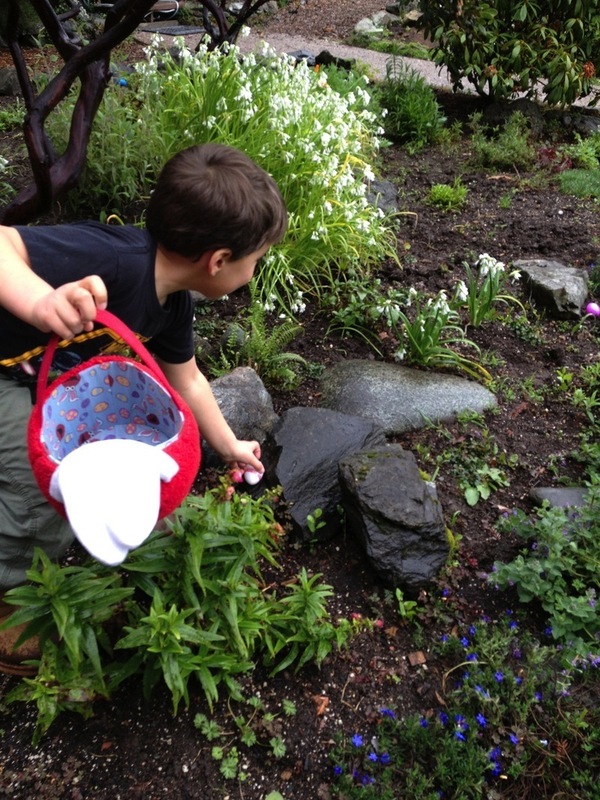 My son has figured out (with my learned assistance) that if the Easter Bunny goes to every house on the same morning to hide eggs, then this bunny must have some special superhuman powers. In fact, as we all know, the only person that has the power to visit every participating house around the world in one day is Santa. We all also know that nobody just works one day out of the year. My son strongly suspects that this "Easter Bunny" thing is just a costume/disguise that Santa wears while hiding eggs so he can work off-season. He has his suspicions about the Tooth Fairy too, he says he thinks Santa has a tutu in that closet. Anyway, to get back to my story, Logan had a two stage hunt this year. 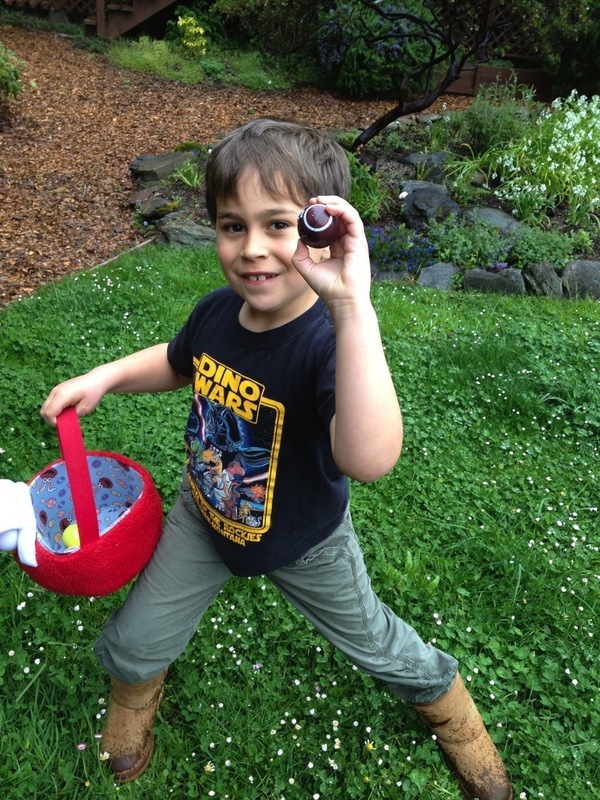 The first part was a traditional egg hunt, providing eggs filled with jelly beans, chocolate candies, and tootsie rolls. (including multiple easter packages with iTunes cards in them, and one with a spot of cash, that easter Santa knows what kids want!). Then, his sister and her fiancee, Joe, along with their friend Leeann had a clue driven hunt for him. He had to decipher six clues, each leading to the next, to find his easter basket from her which not only had candy and treats, but two movies he has not see yet as well, Goonies, and Coraline. I especially liked the twist on the final clue. The basket was hidden behind Logan's iMac. For the sixth and final clue, he had to "buy" hints from the adults using his candy as currency. I told him his basket location would get him "all keyed up" for a tootsie roll. His sister told him the present would be the "apple of his eye", this clue cost a chocolate. Finally, his mom told him "once you go Mac, you never go back" for some Jelly Beans, at that point he figured it out and searched his computer desk, finding the basket! I have made the switch from the soon to be defunct Posterous, to the new Post Haven blog hosting service for my personal blog. It is also not always successful. As twitter has changed (and not for the better) I tried really hard to like the paid alternative service, app.net. I paid for an app.net account, and tried to make some new relationships in that paid alternative to twitter, but it just did not work for me. App.net seems to be a very closed club of developer types that have their own cultural reality, it just did not replace twitter for me. So, despite all the things I DONT LIKE about twitter, (including cutting out APIs and third party developers, sponsored ad tweets, changes to the format, etc), I still use Twitter. However, I think I am going to have a very different reaction to my switch from Posterous to Posthaven. The import of my Posterous blog seems to have gone without a hitch. Everything moved, even the comments. I am looking forward to all the features that the developers are committed to adding to this service, and growing my blog with them as they continue to refine and improve their interface. I really like the idea that even if I quit paying for the editing service, the blog archive STAYS UP, and I can start paying again anytime I need to edit. I don't have the time, energy, or patience for Wordpress. I want and need a KISS principle blogging platform. While $60/year is a fair amount of scratch in internet terms, I think I may be here for a while! Safari 6 (Mountain Lion 10.8.2), Click to Plugin, and Youtube problems. ...and now Youtube videos in Safari play just fine. I have been having some weird problems on my new retina MacBook Pro with Mountain Lion 10.8.2. First, Time Machine backups slowed way down and eventually quit working, then my email started being unsearchable, and finally Spotlight itself appeared to simply quit working. After much investigation, I believe that not only did Spotlight corrupt the search index, it also corrupted Apple Mail and Time Machine. I had to fix ALL THREE to make things work right again. I went through several steps to rectify this, which I thought I would document here. Here is what I did to fix the issue for me. Go to the Home Library folder. This is hidden in Lion. To get to it, select GO in the Finder menu while holding the option key down. Select Library in the submenu. Then navigate to Mail folder/ V2 Folder/ MailData folder. Find the Envelope Index Files. Move just those files to the desktop or trash and restart Mail. Select continue in the message box that comes up. The rebuild could take a while depending on how many messages you have. This resulted in being able to search for contacts, and subjects again in Mail, but whole message searches (body text) still did not work. This did NOT work for me. When I would check the Spotlight popup from the right side of the main top menu bar, no indexing activity was shown. This started Spotlight indexing again, which was verified by checking the Spotlight search box on the main menu bar again, and seeing the “thermometer bar” indicating indexing in progress. After the indexing was completed, I formatted the Time Machine external backup hard disk drive, and started a new Time Machine backup. The backup performed a 40 GB backup via USB 3 in less than one hour. It appears that I am now back up and running, able to search Apple Mail, do normal backups, and use Spotlight in the Finder. I hope it stays fixed! I will post any updates, good or bad, here. 3) Enter your admin password when prompted and wait for all of the tmdiagnose processes to finish. I did this, and then hooked up my backup drive and ran Time Machine - it backed up 3 GB in a few minutes over my USB 3.0 connection. Hope it stays fixed this time! Still broken! :( Time Machine will work for a time or two and then go back to it' old slow sluggish, freezing self. Not happy. This has been going on for months with no fix from Apple. I am trying a tmdiagnose, as described above, to see if I can get it to work even temporarily again.